1. Scope The method is applicable to native and modified starch - preferably starch for sizing of paper and textiles. 4. Procedure Weigh starch sample equivalent to 50 g (w) dry substance (DS) in a beaker (3.2) and add distilled water bringing total weight of starch and water to 500 g.
Transfer beaker (3.2) to a boiling water bath. Attach stirrer to agitator and stir with a constant speed of 250 Rotations Per Minute (RPM) RPM must be reproducible. Stop stirring after 15 minutes, but continue heating for additional 15 minutes. Remove stirrer from agitator, but keep stirrer in beaker. Lift beaker with stirrer out of water bath. Replace evaporated water by weighing and adding water up to gross weight W g.
Measure the viscosity in centipoises (cp) with viscometer (3.1) at 50 oC at 100 RPM with spindle No. 2 Alternative: LVDV-E (LV range) at 60 RPM. For certain applications it is custom to measure viscosity at 30 oC and temperature must be reported. Certain starches may require a different concentration due to their viscosity and the actual concentration of the starch slurry must be reported. 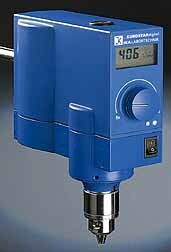 If a Brookfield Viscometer Type LVDV-E (LV range) is available, this instrument may be used with 60 RPM of spindle. The instrument type, spindle number and RPM must be reported. Various instruments, RPM and spindel give different results. 6. Notes The sample beaker must be surrounded by hot saturated air during boiling, hence the lid covering the bath and the sample beaker completely - just with an opening slit for the stirrer. Boiling, cooling and stirring procedures affects viscosity. It is important to reproduce these preparative procedures as well as measurements exactly in order to compare samples. International Starch Institute, Science Park Aarhus, Denmark.